"Add on switch kit" This kit includes only the cable harness and the switch. To use this kit you need the "climate control harness" and type B relay. If you have already bought the "climate control harness" please write "repeat customer" or similar in the comment section on the order and you will receive a 50,- NOK refund (or a free relay. Let me know in the comment). 1 USD is approx 9 NOK. Installation is at own risk. This product is NOT available with the US shipping scheme. 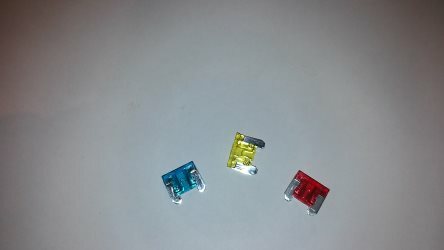 Since it has been difficult to find correct fuses to the fusebox inside the car without visiting a dealer this 3-pack might be the solution. Most gas stations and DIY car repair shops do not have these types of fuses. And these fuses sometimes blow because they provide power to the windscreen wipers and 12v outlets. Have a few spare fuses might save some troubles. I great way to store them is to simply tape them to the inside of the fusebox, or use some of the unused slots. The 3-pack includes: a 10 amp, a 15 amp, and a 20 amp. Please be aware that these are not "mini". They are "low profile mini". This item can only be sold combined with the cable harness, and only with WW-shipping. LED bulbs to replace W8W and W10W (parking lights, license plate lights, front interior lights( and direction lights on US- LEAF)). 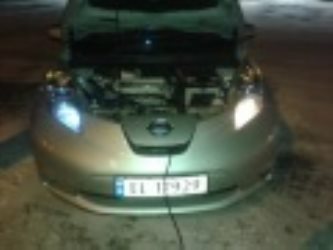 (2010-2012) Swapping out old Wedge bulbs to LED will not give noticeable range increase (at best a few hundred yards) , but gives the LEAF a different look. Parking lights replacement: https://www.youtube.com/watch?v=QOUD083Dkzw Number plate lights replacement: https://www.youtube.com/watch?v=cOmCVvnvLPE These replacement LED bulbs have been tested for over a year in several LEAFs. Cheaper LED replacement bulbs have also been tested, but have failed due to lack of surface area to conduct power. These are high quality LED bulbs and I have tested them with high and low voltage, in humid and salty air. To replace parking lights, license plate lights, front interior light and direction lights on US- LEAF 8 bulbs are needed. On Euro-Leaf only 6. Beware polarity: LEDs only work when the + is on +, and - is on -. If the bulb does not light up, turn the bulb 180 degrees and try again. No harm can be done by installing in the wrong way. This item can only be sold combined with the cable harness, and only with WW shipping. B-type relay for the "add on" kit for the "climate control harness". This type of relay is the most common one. It is advised that you purchase this item via Ali, Ebay or other sites. Switch cover for USB. Suitable if you do not need the USB socket in lower center console. And you do not need to drill a hole to fit the switch.